The 2018 snow season is officially underway. Although the snow cover still has a way to go, snowboarding with friends is what it's all about this early in June. 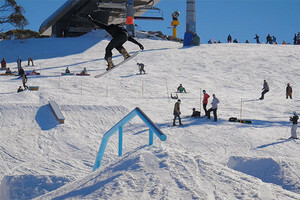 Perisher provided ample cover and a couple of brand new rails for some of Australia's best riders to have a play on. Riders: Joel Cantle, Josh Anderson, Joss McAlpin, Raph Louis, Angus Waddington, Charles Beckinsale, and Ryan Tiene.